Petal, Mississippi — Ben and Beth Simmons have a lot going for them in terms of producing grassfed products and marketing to the public. Pasture can grow here virtually year-round, rainfall is plentiful on an annual basis, and forage tonnage can be impressive. Ben can get many of his moderate-framed Red Angus steers to around 1,000 lbs. live weight, with hanging carcasses at 600 lbs., in no more than 16 months on mother’s milk and grazed forages. The farm is next door to the university town of Hattiesburg, Ben says their processor is topnotch, and very little local competition exists in selling to the health- and local foods-conscious customers being targeted. Ben, who worked for many years traveling the world as a purchasing manager in the corporate world, and who recently retired as a colonel in the Mississippi Air National Guard, has people skills above the norm for a farmer. Since launching in 2010, Nature’s Gourmet Farm has leveraged these and other advantages to grow its markets, product offerings and public profile. 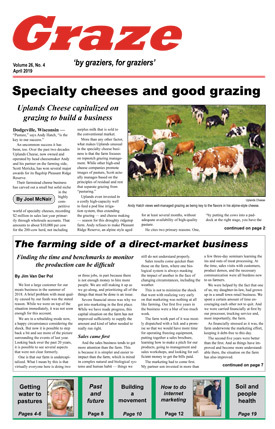 With Beth retiring from her job later this spring, the couple is excited about adding pasture-raised eggs to their current portfolio of beef, pork and pastured chicken. Of course the reality is that very little of this is easy. Low-organic matter soils, fall droughts, mid-winter chills and extreme summer heat and humidity create challenges for producing the forage quality and quantity required to maintain cattle weight gains. On the marketing side, the excellent processor is more than three hours distant, state regulators are placing limits on their business, and too few of the people who indicate that they are interested in what Nature’s Gourmet Farm has to offer are actually purchasing those offerings. The Deep South seems to lag many other areas of the country in terms of support for locally grown, healthy foods. The right thing for Nature’s Gourmet Farm is a pledge not to use antibiotics, hormones, GMO products and limiting chemicals fertilizers, although the farm and its production are not certified organic. At the base of it all is a commitment to North Dakota rancher Gabe Brown’s five tenets for building soil health: minimal tillage, maximum diversity, feeding soil life as many days of the year as possible, cover crops and proper grazing management. The results for the farm’s soils have been impressive, as Ben says that Dr. Rick Haney’s soil test from Ward Laboratories indicated a 50% increase in soil organic matter in these pastures over the past two years, from just above 2.0% to about 3.5%. Any kind of rapid SOM improvement is very difficult to achieve in the Deep South. The Simmonses inherited this farm and its beef herd in 2009 from Ben’s father. “We wanted to do things different from what my dad had been doing, which was cutting as much hay as he could and taking them to the stockyard,” Ben explains. 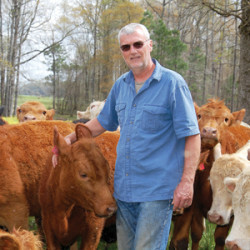 The more he learned about the health benefits of grassfed compared to feedlot beef, the more he wanted to develop his own production and marketing models. Ben has since purchased more land, cleared 110 acres of trees, and now has 265 acres of open ground for grazing and hay. About half the acreage is in warm season perennials — primarily bahiagrass. Quantity is great but quality could be better, so Ben has taken to no-tilling Durana white clover into the sod just before the bahiagrass takes off in late-spring. Cow-calf pairs spend their summers here. Yearlings carried through summer are on annual mixes that usually include Chinese red peas, Red River peas, BMR sorghum-sudangrass, Pearl millet and sunflowers no-tilled primarily in April. These are grazed tight in late summer to prepare for fall seedings of oats, multiple ryegrass varieties, a couple of clovers, radishes and, this fall, hairy vetch. Multiple seedings are done from early September into October with a goal of providing quality grazing for newly weaned steers and heifers by late November. With virtually no rain for three months last fall, Ben was forced to replant a portion of his fall annuals. Seeds are the farm’s single largest expense. This year the plan is to replace roughly 40% of the seed budget with commercial fertilizers, as soil tests have shown shortages of N and K, and Ben says he’s seen too many plants that are obviously suffering nitrogen shortages. He’d like to have access to poultry litter at a reasonable cost, but a federal program subsidizing shipment of a large portion of Mississippi’s supply to row crop farms in Alabama has put it out of reach. While he would like to go entirely without tillage, Ben says compaction problems on some acres require tillage with his Hay King renovator. With the front coulter set vertically and the rear shanks set a foot apart and eight inches deep, the goal is to allow better water and air penetration without turning the soil. “It seemed to make a difference last year,” he reports. 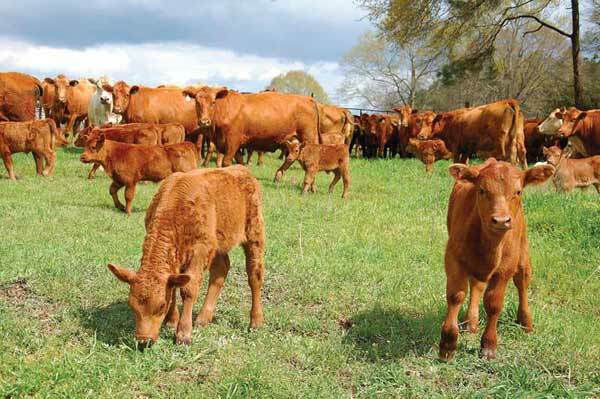 Deep South ranchers deal with plenty of seasonality. The greatest grass growth comes during the summer, but the extreme humidity prevents the stockpiling that would come in handy for the early-fall flat spot when the winter annual crops are not yet ready to graze. So last year Ben made 350 round bales largely from fields dominated by bahiagrass. The hay was fed to late-gestation cows and heifers as part of his strategy of keeping the nutritional plane fairly low to keep calf size reasonable and calving problems minimal. Hay is fed where it was cut by spacing bales across the pasture. Seasonality is also a fact of life with the cattle, as yearling gains tend to stall out through the summer due to the reduced quality of the annual grazing crops in the heat and humidity. On the other hand, Ben believes that meat quality is actually improved for the animals that are carried through this time. Red Angus breeding is producing a uniform herd of moderate-frame cattle. Roughly 80 head of cows and heifers calve on the annual forages in February and March. From a start with Angus/Charolais-cross cows, breeding centered on mid-framed Red Angus is showing signs of developing a relatively uniform herd averaging just over 1,000 lbs. at maturity. Stock water for part of the acreage is provided by a well, with the rest pumped from a pond. Calves are weaned onto annuals around Thanksgiving. Ben practices low-stress handling by working them without four-wheelers, dogs and prods. While visiting, Graze was impressed with the calmness and curiosity of the yearlings. By early June, the first animals sold as custom-cut halves and wholes will be sent to the processor, with harvesting continuing through the summer with a goal of being completed before the start of planting in September. Ben says backfat thickness is usually in the half to three-quarters inch range at this age. Local plants posed problems in terms of cost and quality, so each group requires two, seven-hour round trips hauling live cattle and returning several weeks later with frozen packaged beef in an insulated freezer trailer. Ben and Beth do have at least one local asset in the form of a reasonably priced cold storage cooperative. This gives Nature’s Gourmet Farm a steady supply of meat to offer throughout the year. Enterprise stacking is definitely a happening thing here. Cornish-cross broilers are raised in chicken tractors made of small-diameter PVC pipe covered in lightweight tarp and moved around near the Simmons garden. At about a hundred pounds, the pens are relatively easy to handle while also being quite stable in high winds if properly staked at the corners. Batches of 140, day-old chicks are started in a brooder house beginning in late February, with the final group started in early September and processed in November. Ben says death loss has averaged 7% or lower from arrival through processing, which is done in four morning hours by Ben, Beth, Beth’s parents and two customers (who get their chicken at half-price) in an open-walled, cement floor shed that features a homemade plucker and a scalder retrofitted from a conventional hot water heater. After lunch, three people put the five-pound dressed birds in shrink bags and place them in ice coolers for delivery the next day to pre-ordering customers. 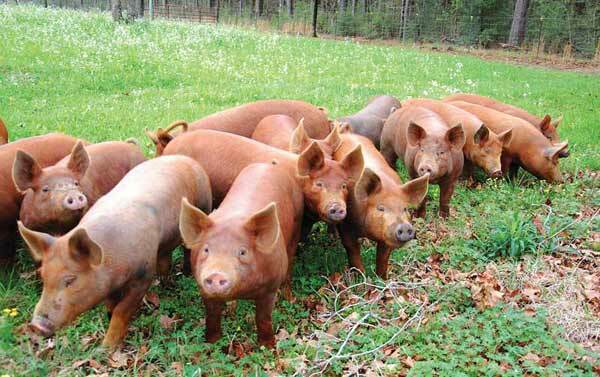 Tamworth hogs are a nice addition to Nature’s Gourmet Farm offerings. Tamworth hogs were added about three years ago. Purchased three times a year from a local farm in groups of 12 to 15 newly weaned pigs, they are raised entirely outdoors in woods and pasture areas with access to a small creek and a non-GMO mill mix. A single hot wire set a few inches above the ground generally keeps them properly confined. Ben is looking at clearing the perimeter of a 40-acre open woodlot, installing perimeter and cross-fencing, and using this area as his primary pork production area. The Tamworths require eight months to reach 350 lbs. dressed weight. The latest project, pasture-raised eggs, is scheduled to launch this spring. Ben bought the materials for a steel-frame, tarp-covered moveable hen house from Ohio and nest boxes from Indiana, and was expecting to be finished with the assembly in April. Sized for 1,000 hens, he’ll start this spring with 500 ISA Brown layers. Also nearing completion is an egg processing building housed within a metal Quonset shed. The insulated facility includes repurposed two-by-six studs, washable walls, and insulated floors in a cooling room that will be kept at 45 degrees F. by a window air conditioner. “We believe the eggs will help sell the beef and the pork,” Ben says. While the trend is definitely moving in the right direction, he acknowledges that the marketing is a bigger challenge than the production. Ben and Beth have invested no small amount of money and effort in the sales end of the business. In addition to the custom-cut halves and wholes, once every four weeks Ben makes trailer deliveries to a handful of pickup sites in southern Mississippi. Customers pre-order on the farm’s website using the GrazeCart platform developed by the Hitzfield family in Indiana. Frozen beef and pork are offered in several 10- and 25-lb. “shares”, and chicken comes fresh in half and whole portions for customers with limited budgets and freezer space. The farm also supplies beef and pork to a local health food store and will add pork to a local grocery chain, with the eggs slated to be offered to all of the above. The farm’s website is loaded with favorable comments from customers about the quality of the products and service. Ben hired a young woman to make regular posts and produce monthly videos for the farm’s Facebook page in an effort to connect with current and potential customers. He says the farm’s website needs some additional product visuals as sales aids, and he intends to make that happen. He says the biggest risk to his business is the lack of processing facilities, and worries for the future of Nature’s Gourmet if his current valued partner quits the business. Ben has been active in working to level the playing field for direct marketers and their allies, and recently traveled to the state capitol in Jackson and to Washington, D.C., to talk with his elected representatives. The potential remains great, and Nature’s Gourmet Farm is in the lead in this part of the world when it comes to offering the kinds of foods that consumers are increasingly asking for, while providing a relatively simple and easy way for them to purchase. Will such an effort work out in southern Mississippi?